Frequently Asked Questions - MacMulkin Corvette - 2nd Largest Corvette Dealer in the World! Below is a list of Frequently Asked Questions regarding Corvette purchasing as they relate to direct purchase, ordering, shipping and the entire process from start to finish. Do I have to come to New Hampshire to buy a Corvette from us? NO! We are are extremely experienced in handling your entire purchase process without you having to physically come to our dealership. What are the exterior/interior (top if applicable) colors? The year, make, model, VIN and mileage? Does the car have any service lights on or check engine lights? Does the car need any servicing? Does the car have a clean Carfax? Any paint work, chips or scratches? Any scrapes underneath? What is the condition of the front bumper or rocker panels? Is there any curb rash on any of the wheels? Tire wear (if tires were changed, what brand and how many miles ago)? Is there a front plate installed or mud flaps? Please list any/all after market parts? I want to purchase one of your in-stock Corvettes / order a Corvette, but live across the country, what do I need to do? Below is what we would need if you decide that you would like to purchase one of our in-stock Corvettes or would like to place an order for a Corvette. Keep in mind that we have NO DEALER DOCUMENTATION FEES! Copy of your drivers license or both if it’s in 2 names. If you would like to have the car delivered to a local Chevrolet dealer near you (Courtesy Delivery), give us a list of the local Chevrolet dealers of your choice for the Courtesy Delivery and we will arrange the delivery with that dealer. Courtesy Deliveries typically cost $350 – $500 that you would pay to that dealer. If you’re financing the vehicle and not paying cash. We need to make sure there’s no issue’s at time of delivery getting approved. No exporters, brokers or dealers. All vehicles must be registered. If financed through us, we must roll sales tax into the loan to ensure the vehicle gets registered and we get funded on the contract. Twice a month GM loads their “Estimated Shipments” into the order workbench. They determine how many of each product a dealer has “earned”. Based on a “snapshot” of their inventory, they consider their “adjusted day supply” (ADS) to the national ADS. The dealer then reviews the estimated shipments and enters their 3 month forecast and requested quantities and submit to GM. Unless GM has more capacity at a factory than dealers request, the dealer is limited to what allocation they are assigned. Dealers can turn down allocation, and those units go to dealers that have requested more than GM estimated for them. This is the amount of product the dealer gets after GM has reviewed their requested quantities. Dealer Order Submission Process is the weekly order cycle. On Thursday dealers can place orders for units allocated to them. Orders must be placed by 9 PM Eastern Time Saturday. Basically they have a three day window to submit orders weekly. If you go to tour dealer and order on a Tuesday, it will actually not go to GM until Thursday. But if you order on a Sunday, you have to wait for the following week to get your order in on that coming Thursday. The weekly process consists of 4 stages. 1. Constraints Distribution – Dealers are informed on constraints to review before placing orders. 4. Dealer Review-You can review your placed orders for changes or replacements until Tuesday at 9pm ET. That’s when the orders are sent for production. This is when GM Work Bench will allow you to build a car in the system. This isn’t the same as submitting an order to GM. Mainly the dealer has time to craft the cars they might want ahead of GM assigning allocation. Status Code 5000 – Your Corvette has been delivered to the dealer: If your Corvette order reaches status code 5000, your Corvette has either arrived at the dealership that you placed your order from, or if you did the National Corvette Museum Delivery (RPO R8C) – your Corvette will be delivered to the National Corvette Museum and not the dealer you ordered it from. 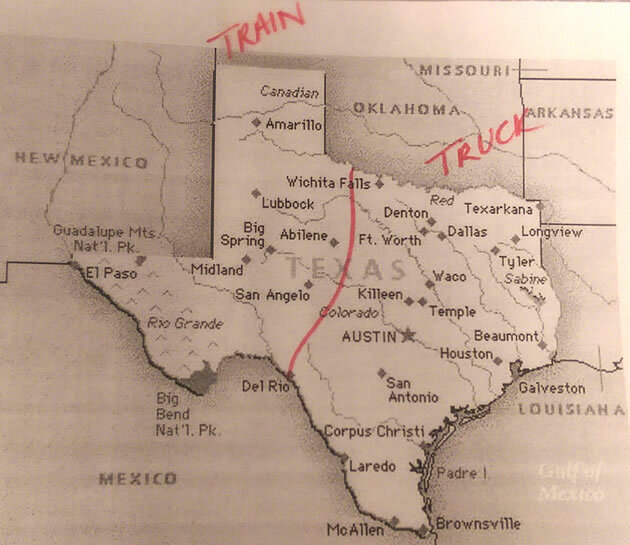 Texas Map showing rail vs. direct delivery. Shipping Time via Direct Shipment: If your new Corvette is being shipped to a state not listed above, the time between ordering and taking delivery is approximately 5 – 8 weeks based upon recent history. Special Edition / Limited Production Corvettes: Because these Corvettes are usually built in batches at the Bowling Green Corvette Assembly Plant, there is no way for us to predict when the factory will decide to do a production run of these cars. As a result, the amount of time it takes from initial order to final production could be longer than normal production Corvettes by as much as three weeks. Unfortunately, this process is out of our control.